One of the most important factors for the enjoyment of any birding tour is the performance of the tour leader. All of our leaders have been chosen not only for their bird-finding ability, but also for their professionalism and enthusiasm to share their knowledge and expertise. It is very important to all of us that everyone gets to see every form of wildlife available in each destination. Of course our primary focus is on birds, but we also have leaders with extensive knowledge of mammals, cetaceans and all other forms of wildlife. Nick is the owner of Zoothera Birding and the main point of contact in the Zoothera office. He has been birding from a very young age, when his dad pointed out the different birds in his garden on the edge of Plymbridge woods in Devon. Since then he has birded all over the Western Palearctic before outgrowing his twitching instincts to explore further afield. Nick has been guiding birdwatching groups for the past 18 years on a full-time basis all over the world. Having led numerous tours in North America, Costa Rica, Peru, Ecuador & Galapagos, Kazakhstan, Kenya, Namibia & Botswana, New Zealand and over a dozen tours to the Gambia amongst other destinations. He now leads the majority of our Asia tours and has built up an enviable knowledge of that regions avifauna. He led the first British commercial birding tours to Eaglenest, Nagaland & Mishmi Hills and was the first Brit to see Naga & Mishmi Wren-babblers. He also has an interest in mammals, cetaceans and butterflies and is always willing to pass on his knowledge to fellow travellers. Nick will be leading tours to Yunnan, NE Brazil, Borneo, Balearics, Sichuan, India, Colombia, Madagascar, Guyana . Steven is our main guide in SE China and has already led several very successful tours for Zoothera Birding. He majored as an International Tour Guide in China and after graduation from college guided numerous cultural tours throughout China for several years before discovering the delights of birdwatching!! Over the past 9 years has become one of the top birders in China, and has much experience in leading birding tours all over his beloved China. We have the utmost faith and confidence in Steven and look forward to many more fun-filled tours with him. Steven will be leading our spring and winter tours to China. Raised in southern Sweden and an active and respected birder, Roger has served on the regional records committee and birded extensively around the world. South America is his favorite continent and he has birded most countries, focussing on Peru and Ecuador. Resident in Quito since 2005, he has discovered several new species for Ecuador, including a first for South America. He is second to none on the Ecuadorian list. A founding member of the Ecuadorian Records Committee, Roger is also an accomplished bird photographer with over 1200 species photographed in Ecuador and a major contributor of recordings to Xeno-canto.org. He is known for assisting serious birders as well as his patience with inexperienced birders and is great at spotting birds and getting people onto them. Roger will be leading our exciting tours to Southern Ecuador and Northern Peru. Conservationist by heart, Tour guide by profession and an ever growing birder, Xavier is Neblina Forest founder, owner and guide. He has been working as Board Member and has been mentor for both AVES & CONSERVACION (previously known as CECIA) and the Jocotoco Foundation. Guiding Ecuador since 1997, Xavier and his team are regarded as the finest guides in Ecuador, where they will now lead for Zoothera. With considerable knowledge of other destinations such as Peru, Bolivia, Guyana and Brazil their repuation for birding in Ecuador is second to none. Neblina unlike many local guides and companies are totally commited to conservation and Xaviers vision has seen Neblina work on reforestation and restoration work with local communities with an ongoing development of ecotourism! Xavier is one of the trustees of the new Fundacion Sembrando Esperanza Foundation, and we praise his work and are delighted to have him and Neblina as part of our team. Alejandro is Costa Rican, a 32 years old now residing in Ecuador, he is a highly trained guide and biology graduate from Universidad Latina de Costa Rica and the most recent acquisition to Neblinas staff. Alejandro has worked as resident naturalist guide at Monteverde Cloud Forest, as a volunteer in Costa Rica's national parks, on the MAPS project at the Institute of Bird Populations in California and at the Redwoods Science Lab, Trinity River Restoration Program at Humboldt University, surveying and mapping nests as well as banding birds. In Ecuador he has conducted bird inventories and surveys, field projects in coastal and southern Ecuador, and conservation work on the endangered Black-breasted Puffleg. Alejandro has also birded Peru, Bolivia, Argentina, Colombia and southern Brazil. He now lives in Ecuador with his wife Agustina. Zoothera are delighted to have Alejandro as one of their guides in Ecuador. His expertise and knowledge of bird calls sets him high in the competitive world of bird guides. We are sure you will be very impressed with his bird finding abilities and a welcome addition to our high quality team of guides. Charles is the latest addition to our team, a native to Namibia and is the foremost bird guide in the country. He has been leading birding and wildlife/safari tours for 15 years throughout his beloved country and has been instrumental in making our 2 tours to Namibia this year so successful. His excellent bird & mammal finding skills, general knowledge and good sense of humour make him a superb ZOOTHERA guide. Upali is the senior most Ornithological Tour Leader in Sri Lanka and a highly accomplished all-round naturalist. He has been leading bird tours for more than 30 years and is well known in the birding world. He was previously attached to the Zoology department of the University of Peradeniya, has undergone training in the U.K. in Terrestrial Ecology and Conservation with attachments to Aberdeen and Cambridge Universities, the Royal Society for the Protection of Birds and the Institute of Terrestrial Ecology, and is one of the local representatives of the Oriental Bird Club (O.B.C.). He is also a Life Member of the Ceylon Bird Club where he has served in the Executive Committee and the Rarities Committee for a number of years. 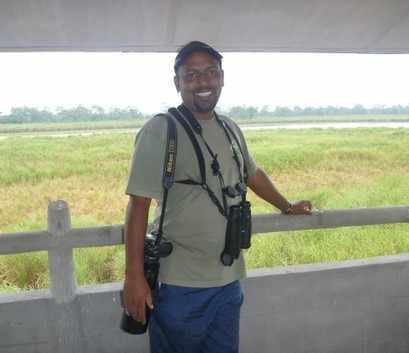 Upali is also a popular lecturer on birds and he took lectures at the Tourism Training Centre of the Sri Lanka Institute of Tourism & Hotel Management from 2004 to 2006. 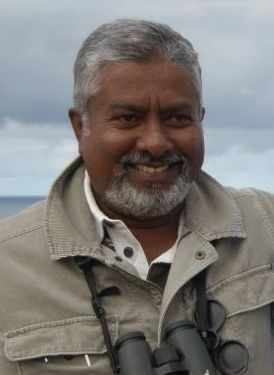 He worked for the IUCN, The World Conservation Union in Sri Lanka for two years from 1994 as a National Consultant (Fauna) surveying the faunal diversity of all Sri Lankan forests which are more than 200 hectares in extent. Upali leads a number of major bird-watching tour groups visiting Sri Lanka annually from Britain, Europe and America. He also works as a Freelance Eco-tourism Consultant in the local tourist hotel industry. Suchit was born in the eastern Terai of Nepal and as a science student had a keen interest in all wildlife. After finishing his studies from St. Joseph’s College (Darjeeling) he worked in a high school in Kathmandu, however, he changed his plans and his wildlife career took off when he started working as a full time naturalist in the Royal Chitwan National Park. Suchit worked at Chitwan for five years and during that time he accumulated an invaluable knowledge of its flora and fauna. He started work as a full time wildlife leader in 1994. Since then his great enthusiasm, cheerful and friendly disposition, together with exceptional knowledge have contributed to many visitors having a successful stay in Nepal. 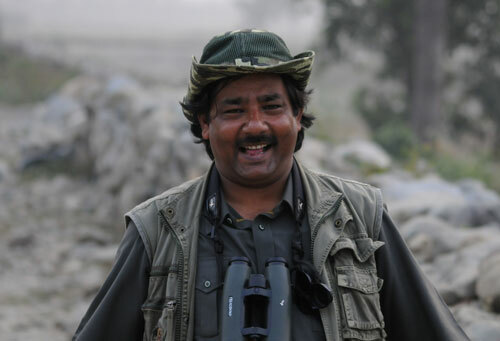 Now ranked as one of the country's leading naturalists and ornithologists, Suchit leads many wildlife tours in Nepal and India and has made 6 trips to Tibet. Suchit has found a number of new species for Nepal; Grey-headed Bullfinch Pyrrhula erythaca, Jerdon’s Baza Aviceda jerdoni, Purple-backed Starling Sturnus sturninus, Rufous-vented Prinia Prinia burnesii nepalicola (an endemic and new sub-species to science), and Indian Cormorant Phalacrocorax fuscicollis are some worth mentioning. Tika was born at Sauraha on the edge of the Royal Chitwan National Park. His knowledge of the birds and mammals of Nepal is vast and has been gathered over many years and by much hard work. In his ten years at Chitwan National Park he established his expertise, ultimately becoming the senior naturalist. He is a great companion and no ornithologist knows Chitwan better than Tika and no one else has seen as many species there. He has travelled and trekked widely all over the Indian Subcontinent leading many birding and wildlife groups. As one of the very best Nepalese naturalists the insight he is able to give into his country's culture and traditions is excellent and informative and makes any trip to the Himalayas a truly enlightening experience. Tika has conducted a number of birdwatching identification activities in Chitwan and at Koshi. He has recently found the Small Snowfinch in Ladakh as a new species for the Subcontinent and Black-naped Oriole Oriolus chinensis as a new species for Nepal. 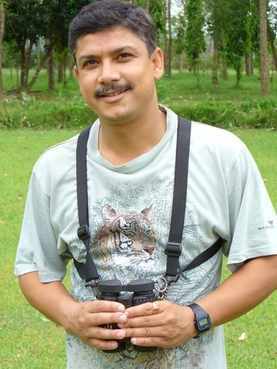 Tika has led nearly 200 bird tours which is the highest total of tours led by any bird guide in Nepal. Peter is a long time friend and colleague of ZOOTHERA BIRDING and is the proprietor and CEO of Adventure Gurudongma. In the last ten years he has organized and guided tours for international birding groups to the remotest parts of India and Bhutan. He has an extensive knowledge and experience of guiding in all parts of India and Bhutan and is always keen to show his clients the most special, rarest and skulking species. He has been guiding high altitude treks, wildlife safaris, tribal tours and a lot of other “off the beaten track” adventures to all parts of India and gained a very impressive reputation, as well as an amazing network of contacts across the subcontinent. During treks through various habitats, he developed an interest in birding, which became a passion. The ability to spot and identify birds, expert knowledge about “hot spots” and habitat, and rapport with local people and guides are his greatest assets especially in north-east India. He recently discovered the first record of Hodgson’s Frogmouth as a new species to Bhutan, amongst an impressive array of other fascinating ornithological discoveries in his beloved country. He is trained in wilderness first aid by the Wilderness Medicine Institute of the USA. At present after his Master’s in Ecology and Environment and MPhil in Ecotourism he is pursuing his PhD in Bird watching and Ecotourism.